Brazil is one of those countries I always dreamed about visiting, and in the winter of 2005 I made my first journey there. Over the next 3 years I spent 10 months total exploring parts of the vast and fascinating country. 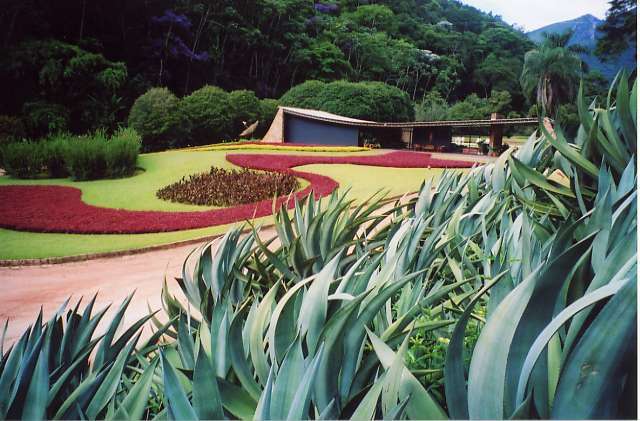 One of the main reasons I wanted to come here was to see first hand the gardens of the Brazilian landscape architect Roberto Burle Marx. 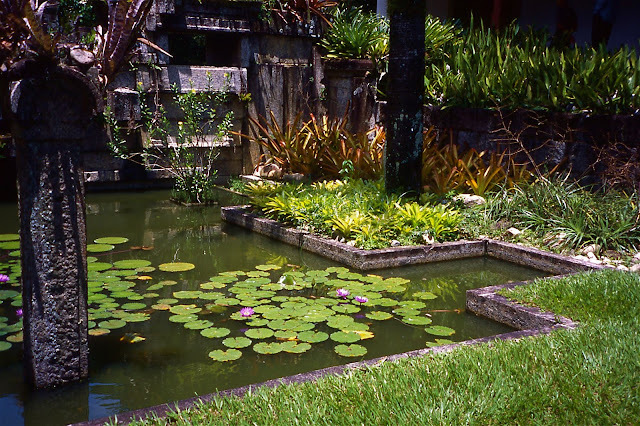 Widely considered to be the father of modern landscape architecture, Burle Marx was a renaissance man of many talents, an accomplished abstract painter, sculptor, jewelry designer, florist and vocalist. Born in 1909 in Sao Paulo, his family eventually settled in Rio de Janiero in a house in Leme, at the end of the Copacabana beach near the iconic stone mountain, the Pau d'Azucar or Sugar Loaf. At that time the houses had gardens. Now it is one of the most densly populated places on Earth, a strip of high rise apartment buildings wedged between soaring granite cliffs and the sea. At that time in gardening history, native Brazilian flora was shunned, as European influence was paramount. The plant palette was limited to what was imported and laid out in formal borders of little originality. 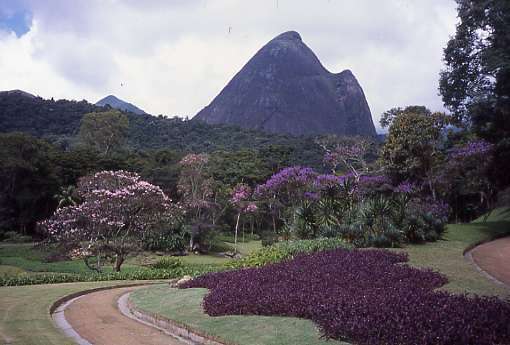 It wasn't until the Burle Marx family moved to Germany that Roberto discovered the beauty of his homeland's biological richness, in the hothouses of the botanical garden at Dahlem in Berlin. 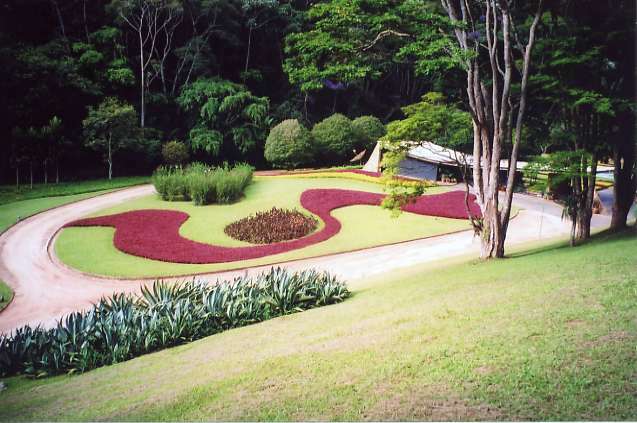 When the family returned to Brazil, Roberto developed his skill at arranging flowers for events, and was asked to design gardens for residences. 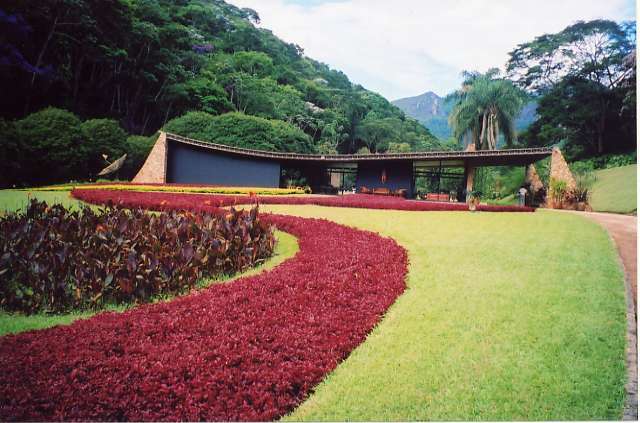 His first commission was to design a garden for a project of the eminent Brazilian architect Lucio Costa. But the availability of native plant material was sorely limited. After many years of searching for the ideal property in which to develop a new garden and nursery, he found his dream property in a valley some distance south of Rio near the small town of Guaratiba, a two hour trip at the time. There he restored the old house and chapel and began propagating plants collected on numerous expeditions in to the wilds of Brazil. 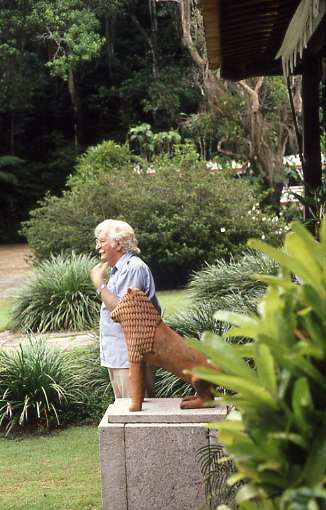 Over the years he developed an extraordinary landscape climbing the hill and introduced hundreds of previously unused plants to the gardening trade. His interest in painting had a great influence on his designs. His drawings for gardens look like abstract works on paper. 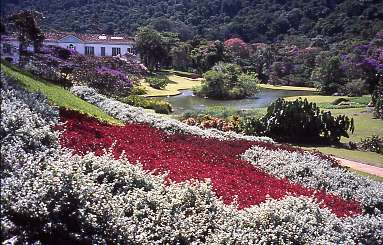 The gardens themselves usually contain large masses of vividly colored plants in a wide variety of textures, relying more on foliage than flower. They are laid out in bold sweeping forms. Garden structure tends toward the architectural, often with rectangles that reflect the forms of surrounding buildings. 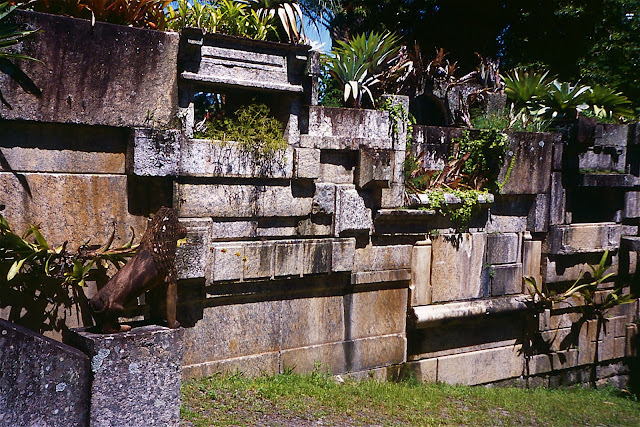 As his fame grew, he was commissioned to design parks and gardens throughout South America and abroad. When traveling, he most appreciated the economy of a space's design, using a limited variety of plants for a homogenous look. The look of the period was decidedly modern. 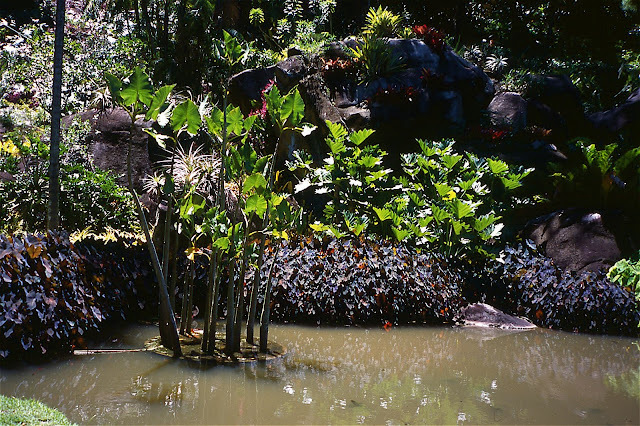 In his own garden, called the Sitio Burle Marx, the economy is more relaxed than in his other projects, as there are some 3,500 species of plants in it. Still, plant groups are massed for harmonious composition. 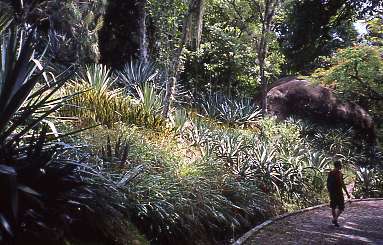 There are large areas of a single type of ground cover surrounding clumps of sculptural agaves, bromeliads, plumerias, dracaenas, clusias, palms and a myriad of other plants. 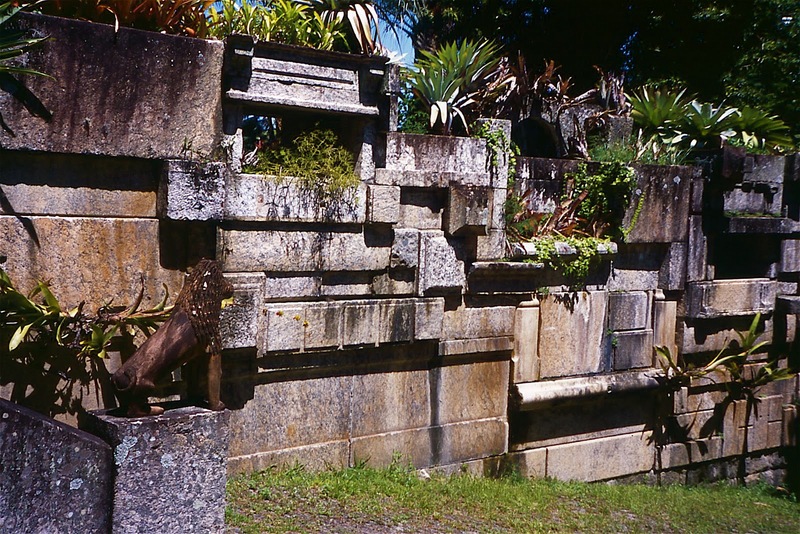 Plants are always used to emulate the way they would grow in their natural environment. Large clumps of colorful bromeliads spill over boulders as they would in the jungle. Wet areas swirl with voluptuous bands of alocasia and thalia. Trees and palms are clustered in natural looking groups. 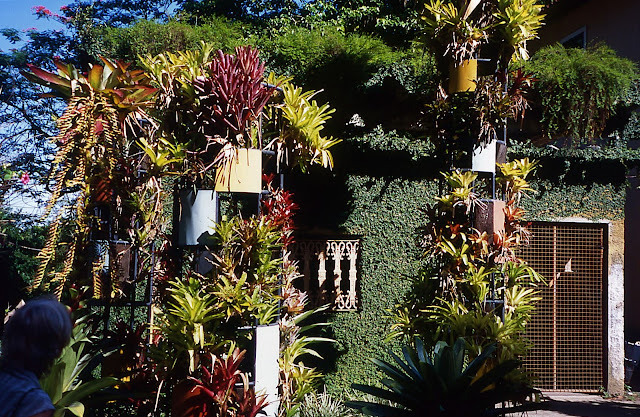 There are colorful enameled steel structural towers covered in bromeliads flanking the entry drive by a long pink stucco visitor's center. 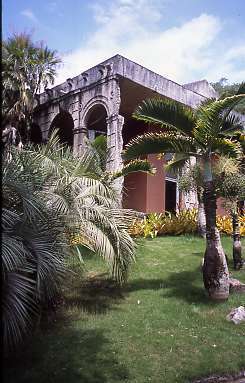 Beyond this are large shade houses filled with an enormous collection of tropical plants, some of them named after him. It is one of the most beautiful gardens I have ever seen. Everything is used in a sculptural way, with contrasting shapes and colors. 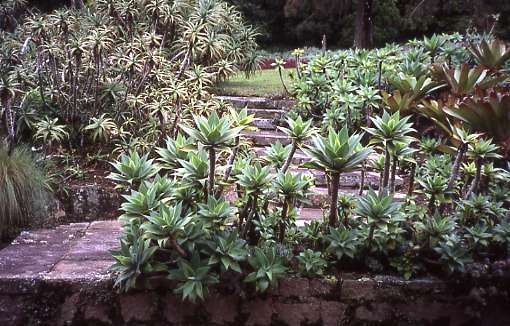 A winding stair passes through treacherous plantings of spiky Agaves leading up to the house, where a small lawn flanked with bromeliads and Sansaveria and palms ends at a architectural lily pond. Behind this is a wall composed of old granite pieces from demolished buildings in Rio. This wall was the primary inspiration for the one in my garden. I loved the way he mixed varying shapes and details to make a vertical mosaic. 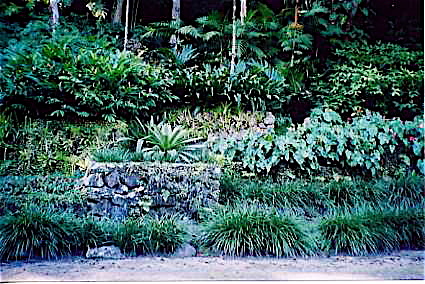 The wall is planted with a variety of Bromeliads. A lovely chapel dating from the 17th Century forms one side of an area with trees draped in huge Staghorn Ferns. 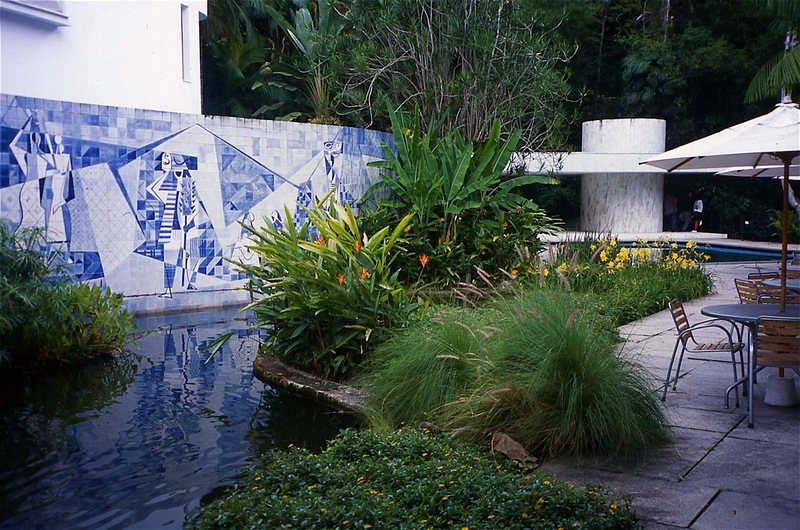 A connecting covered dining area is covered with blue and white Portuguese style tile painted by Burle Marx. Dried seedpod encrusted chandeliers hang overhead. 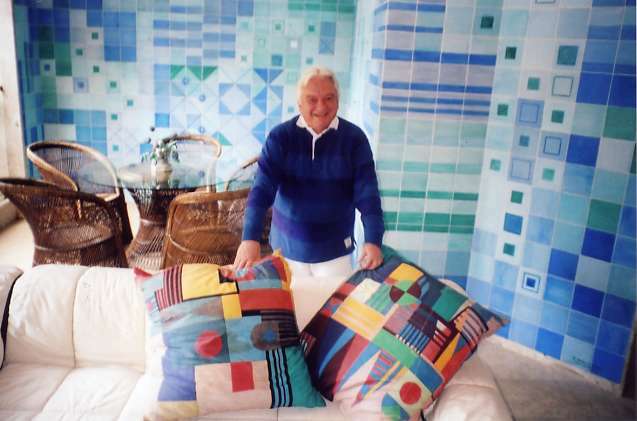 Burle Marx would create lavish arrangements for parties, and sing to his guests with an operatic voice. From what I hear his parties were legendary. Behind the house is a large covered barbeque terrace. 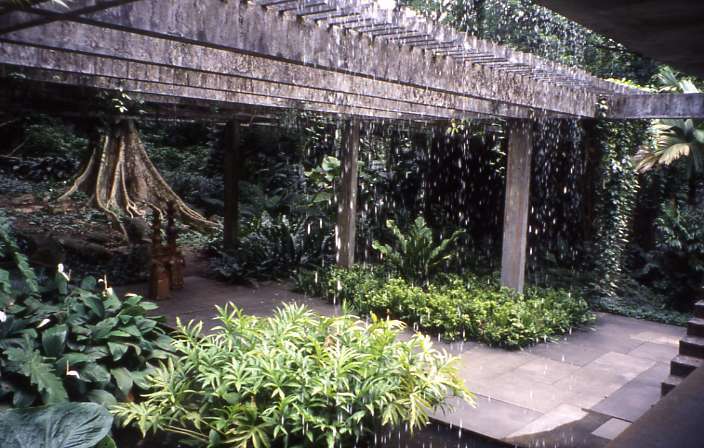 Water cascades in a sheet off the flat roof into a lush pool, cooling the air. 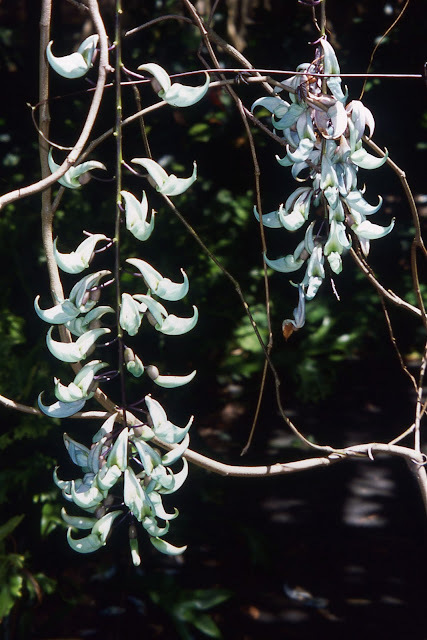 The surreal turquoise colored claws of Strongylodon macrobotrys, the Jade Vine from the Phillipines hangs from the roof as well. 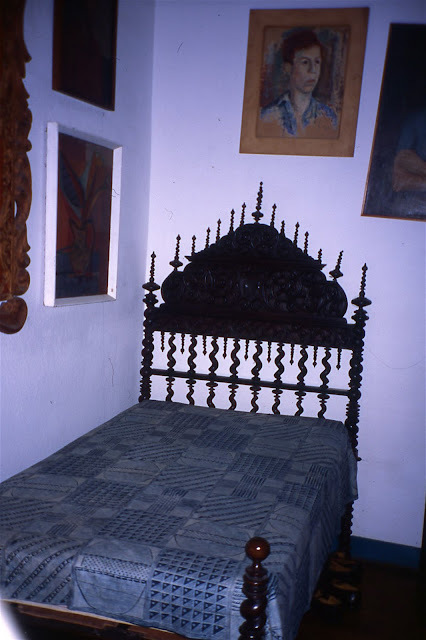 Beds are mulched with large cannonball like stones that are a signiture of his designs. Further up the hill is a beautifully crafted studio that was built near the end of his life of carved granite pieces from a dismantled old coffee mill. The studio has a comfortable apartment and a large airy gallery displaying some of his art works and project models. All around the building are beautifully composed masses of plants with colored foliage and bold textures. A cobbled road winds down the hill providing access and being attractive at the same time. It curves in a way to provide vistas of the garden after crossing a ravine with a trickling creek. I have been to the garden 3 times as it is something of a pilgrimage to visit this spectacular place. There is an affordable mini bus that makes the journey back and forth from Ipanema so that you don't have to go to the great expense of taking a taxi. I spent half the time I was in Brazil living in Rio, as it is a captivating city in the most dramatic of settings, with breathtaking beaches and a vibrant social life. Add to that the frenzy of Carnaval and you have a city that is hard to leave. I was fortunate both of the first and second trips to be able to accompany a tour of Burle Marx gardens led by Englishman Jeff Sainsbury. 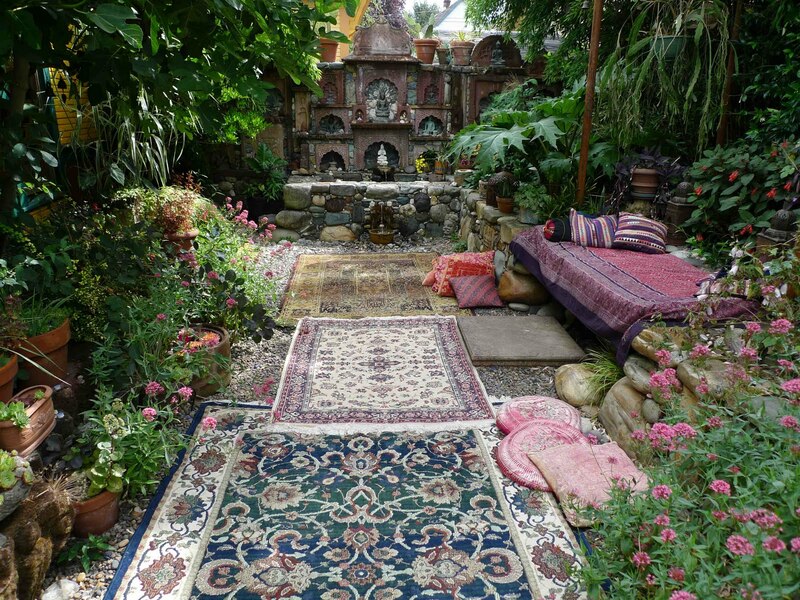 He organizes excellent garden tours, usually in Europe, but also in the Caribbean and Brazil. He has a web site at www.jeffsainsburytours.com. In fact he still uses two photos of Burle Marx gardens that I took on the second tour. A Landscape Architect friend of mine, Mert Hauck had been on one of his tours in Italy and put him in contact with me when he did his first scouting trip to Rio. 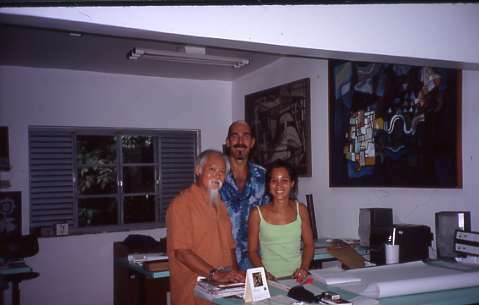 I took him out to the Sitio in Guaratiba and showed him around the area close to the hotel in Ipanema, and to meet with Isabella Ono, the daughter of Haruyoshi Ono, who became Burle Marx business partner in 1968 and now runs the firm. They made the arrangements to visit the private gardens, which are seldom open to the public, and Isabela accompanied us on part of the tour. Early one morning we set out from the Ipanema Plaza Hotel for Petropolis, an idyllic rural retreat high in the mountains inland from Rio. We passed through the ugly squalor of the Zona Norte, but then as we approached Teresopolis, the landscape grew dramatic, with valleys covered in blooming purple Tibouchina, orange African Flame Trees, and yellow Tipuanas, which is a truly electric color pallet. Our first stop was high in the mountains at the estate of Ralph and Anna Lisa Camargo. They graciously greeted our group and walked around the expansive grounds with us. One of the most interesting areas was one that had been used to test out the viability of various plants, which were then retained for their grown in beauty. The plantings are richly mixed rather than in bold swaths. It is actually something of a relief at times as bold sweeps of identical plants requires a more conceptual mindset to appreciate. 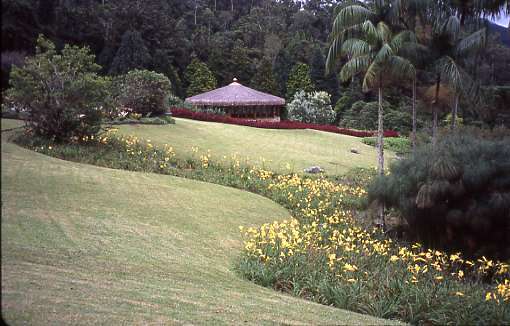 On slopes backed by dark Araucaria trees are sweeps of Phormiums and Pampas grass, surrounded by purple Tradescantia and yellow daylilies in graceful curving beds. We visited magnificent private gardens not usually accessible to the public. 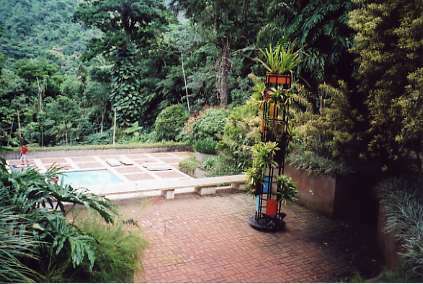 The most famous is the Monteiro Garden, commissioned by his enlightened original client Odette Montiero, and later restored by Roberto for a new owner. It inhabits a spectacular valley in the granite loaf shaped mountains of Petropolis, a cool retreat from the sometimes oppressive heat of Rio. The narrow valley is a living painting of vibrant colors. Swaths of purple and pink flowering native Tibouchinas were in full bloom on both visits in early March. Winding paths lead up the valley with incredible mountain views. On the valley floor are amoeba shaped pools fed by a stream that drops at leveled cascades. 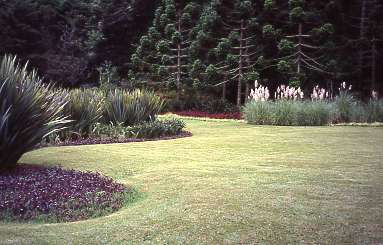 Equally curvaceous beds contain single species of plants to create swaths of color. The shapes emulate those of the surrounding terrain in a harmonious composition. At the upper end is a barbeque terrace with a bright yellow tile mosaic wall designed by Haruyoshi Ono. Above this the stream is channeled in to a series of cascades running in an awkward straight line, totally unlike the rest of the garden. This feature was added later and feels inappropriate to the overall design. Another incredible garden is the Strunk Residence, with a simple low slung transparent house designed by the Brazilian architect Oscar Neimeyer who was responsible for the monumental architecture of the new capitol at Brasilia. The forms in the landscape play off of the curved roof on the simple rectangular house and the undulating jungle covered hills. 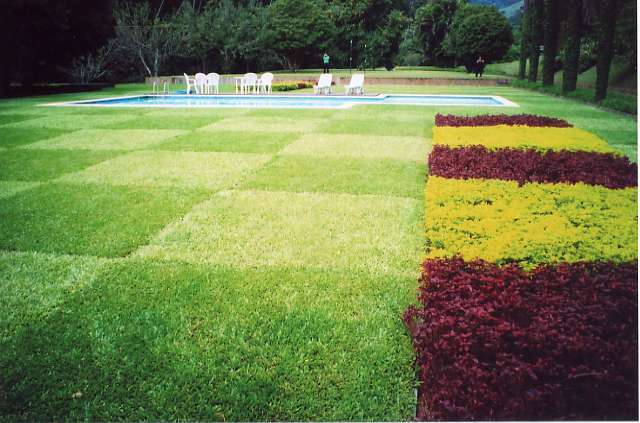 A lawn, planted in two colors of grass in a checkerboard pattern surrounds the rectangular swimming pool. An otherworldy sweep of red Iresine creates one of the most visually dramatic plantings I have ever seen on the other side of the house, leading to a voluptuously curvaceous pond. 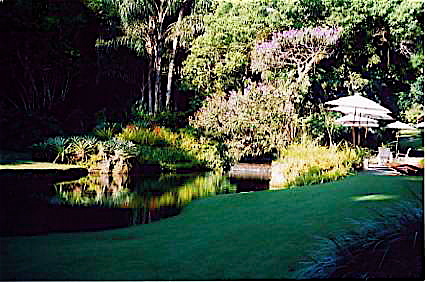 Another garden in Petropolis that we visited is the home of Raul Martin. He graciously greeted us and walked us through his verdant gardens and lovely home, telling stories about times he had spent with his friend Roberto. 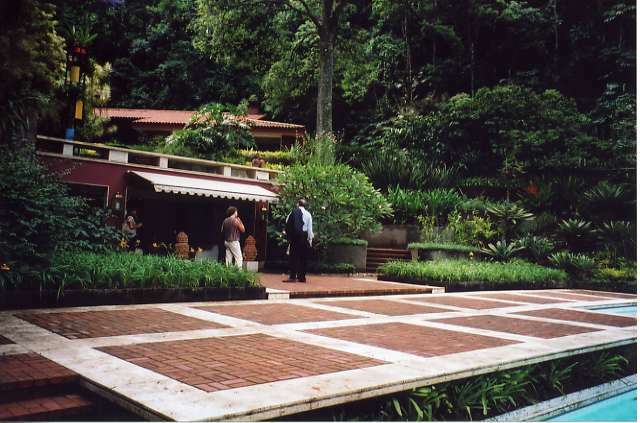 The paving here features red brick, an unusual material for a Burle Marx garden. 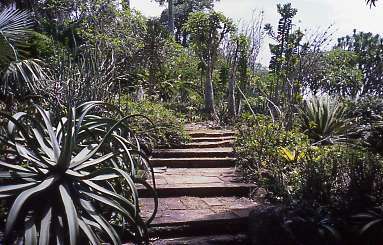 Terraces overlook dense jungle at various levels on the steep slope connected by wide steps. A terrace off the house forms the roof for the pool house below, which has blue and white tiled walls and comfortable furniture. The ordered architecture of the house and terraces blends wonderfully with the wild surroundings. What a pleasure to visit this garden! Back in Rio we visited another private garden behind the soaring twin peaks of Dos Irmaos above Sao Conrado, the home of Meninho Magalhaes Lins, another prominent banking family. My photos of this garden are grainy, but the garden is best known for its fabulous naturalistic swimming pool, fed by a clear stream coming out of the jungle. The house has an elegant long low terrace where the live in staff served us snacks. Parking is on the other side of the stream, which is crossed by a bridge to reach the house. 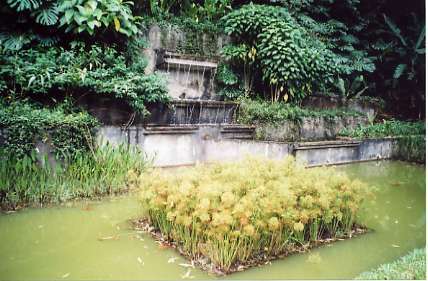 A small dam creates the pool, which would be a delight to swim in with the heat and humidity of the region. Terraced plantings step down the hill in bands of varying texture. In the upscale neighborhood of Gavea Alto near the Jardim Botanico in Rio there is a beautiful modern house that is now the Instituto Moreira Salles and is open to the public. Built by one of Brazil's wealthiest banking families, this is one of the finest examples of modern residential architecture I have seen, mainly because the details in the construction are so finely rendered. There are lush gardens at the front of the house playing off the surrounding jungle of Parque Nacional Tijuca which protects Rio's watershed. To the right of the simple entrance door is a terrace of polished granite diamond shaped tiles and a perforated white painted concrete screen. 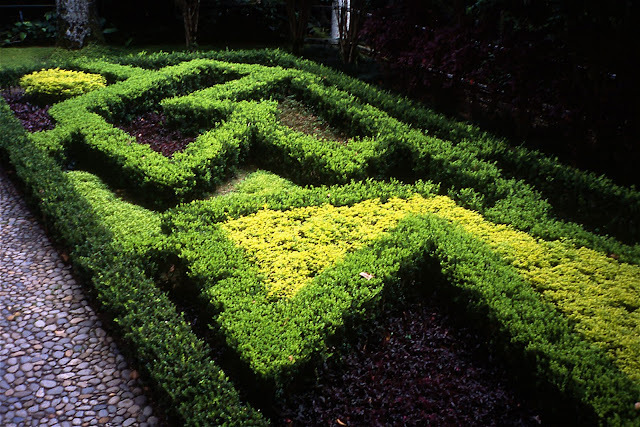 Below the terrace is an unusual modernist take on a parterre, with green and gold shrubs clipped in angular forms. 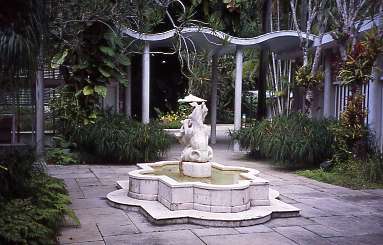 Inside the house is a simple courtyard with a fine central fountain of white marble, and a breezeway with an undulating wave like roof. Sculptural small trees in the courtyard have colorful Bromeliads attached to their trunks, and large leaved Philodendron vines climb others for bold contrast. Beyond the breezeway is a swimming pool with a sleek white pool house and a pond backed by a tiled wall with a famous mural designed by Burle Marx. Heliconias, daylilies, and grasses fill the island beds, and there is a popular cafe with tables to sit and enjoy this part of the garden over lunch or tea. A beautiful cluster of Pau Mullato, or Calycophyllum spruceanum trees, with dark, polished skin like trunks is perfectly placed in one of the rectangular beds. I first noticed these handsome trees in the nearby Jardim Botanico planted in alleys along straight paths. There are so many wonderful plants native to Brazil. Ohe of the largest of Burle Marx numerous public projects was the enormous land reclamation of Parque do Flamengo in Rio, a huge landfill created when the Sao Antonio hill was leveled in 1965. The project consumed a great deal of his energy and was at times surrounded by controversy. He was the primary supplier of many of the plants because his nursery was the only available source for many of the species. Most notable in the garden are wonderful groupings of unusual trees. The park contains an array of activity and sports areas designed with innovative forms to create a modernistic cohesiveness. The designer was greatly dismayed by the later addition of towering light poles that rise high above the trees. 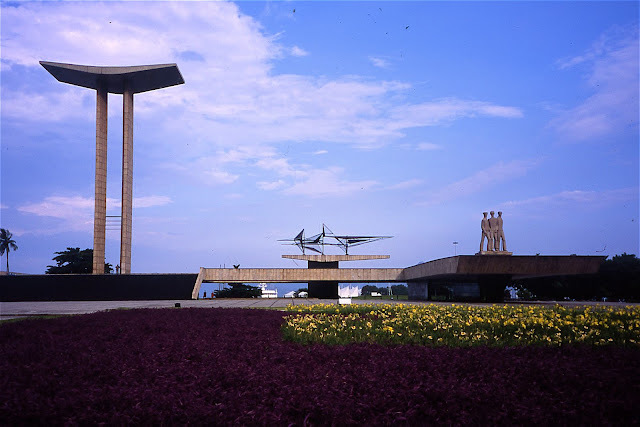 At the center of the park is a sprawling modernist Monumento Nacional dos Mortos da II Guerra Mundial, a monument to soldiers who fought in World War II. Huge swaths of purple Tradescantia and yellow daylilies play off the dramatic architecture of the building. There is also a strange little bunker like building containing the Museu Carmen Miranda with a wonderful collection of costumes and jewelry from her films. The doors open like gull wings on one side. At the downtown end of the park is the Airport terminal like Museu de Arte Moderno. Around the angular building are interesting gardens, with large areas of round stone mulches and sculptural plants. There is a lawn with the wave pattern done in two shades of grass called the Gramado de Ondas, or wave lawn. 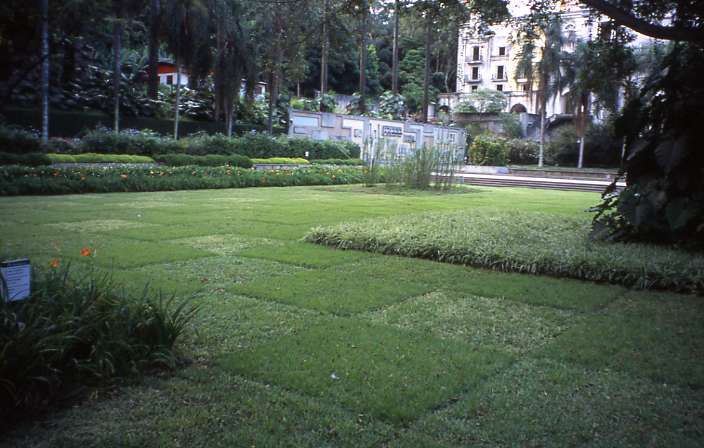 Next to this is the Jardim Geometrico, a garden patterned on rectangular forms with massive sculptural blocks of granite. Purple ajuga and other ground covers fill rectangular blocks of color under a canopy of Plumeria trees. 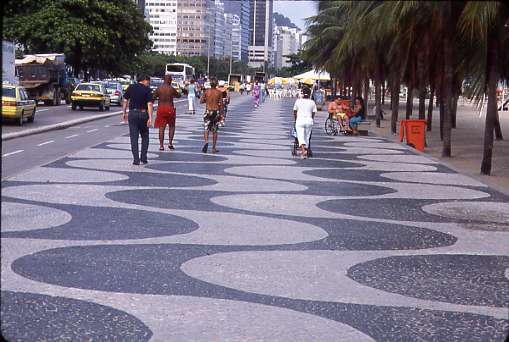 The famous Copacabana waterfront with its long wave patterned mosaic sidewalk is perhaps the most renowned work by Burle Marx. 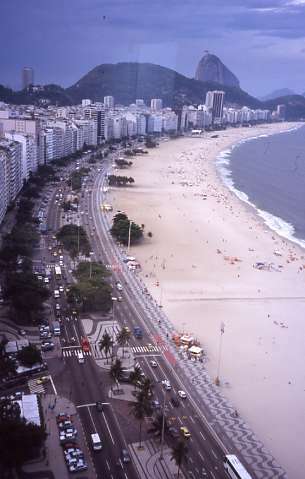 The beach once fronted the buildings along the shore, but was actually moved to make room for the new Avenida Atlantica and large underground parking lots. 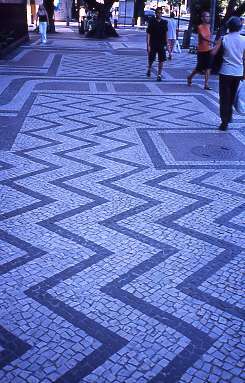 The wide sidewalk adjacent to the Avenida is paved with the classic wave pattern that was originally used in Lisbon Portugal for pavements when rebuilding parts of the city destroyed by a massive tsunami in 1755. The sidewalk is 2.5 kilometers long and is one of the largest mosaics in the World. The design perfectly frames the famed arc of sand backed by the Pau d' Azucar. 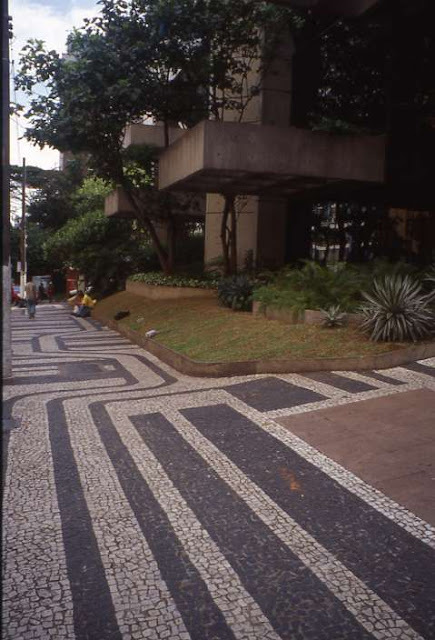 Traffic islands have abstract organic mosaic patterns laid in the Portuguese style to contrast the continuous wave pattern of the main sidewalk. The whole design can be taken in from high up in the many thousands of apartments and hotel rooms that line the beach. The walk makes a classic promenade and is lined with kiosks serving food and caipirinhas. Every New Years over a million people dressed in white gather on the beach in Copacabana to throw white flowers and offerings in to the sea to honor the Orisha Goddess of the sea Yemanja. The fireworks at midnight are incredible, with 3 barges launching rockets over the water. It is one spectacular party, and Rio parties like no other city on Earth. Burle Marx also designed the gardens surrounding the buildings at Brasilia, which I haven't visited. These public gardens are not always as well maintained as one would hope, but the vision is still there. 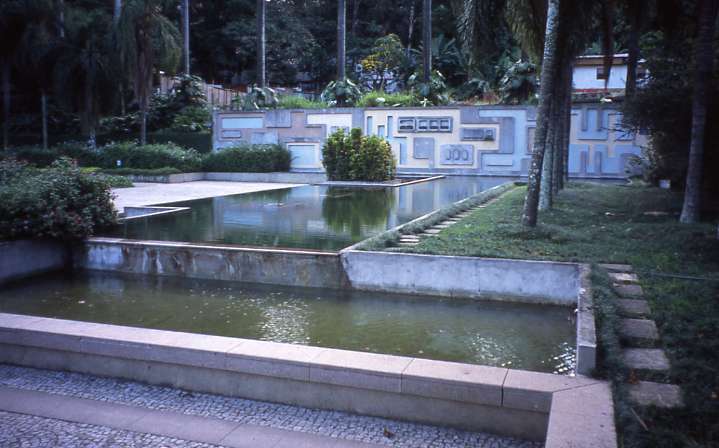 The beautiful massing of trees in groves, the wildly curvaceous paths, the large riverstone mulches, architectural ponds, and the modernist mosaic patterns done in the Portuguese style using small hand cut limestone blocks are signiture to his work. Outside of Rio I visited Burle Marx projects in Belo Horizonte and Sao Paulo. 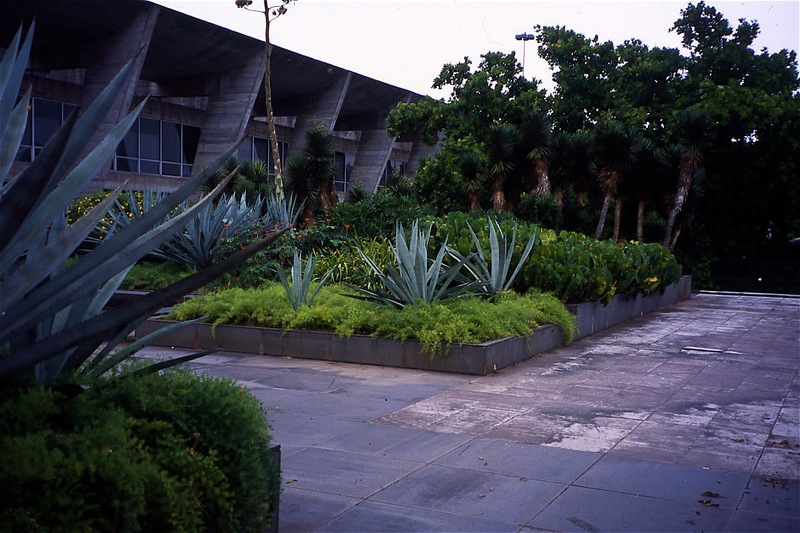 A favorite small garden are the dramatic plantings at the Banco Safra in Sao Paulo. Here, patterned sidewalks play off the of the cantelivered architecture of the building. Carefully pruned trees and giant Vriesea Bromeliads bring the building in to scale and provide lush respite from busy Avenida Paulista. Sao Paulo is a sprawling metropolis, one of the largest cities in the World and the largest in South America. 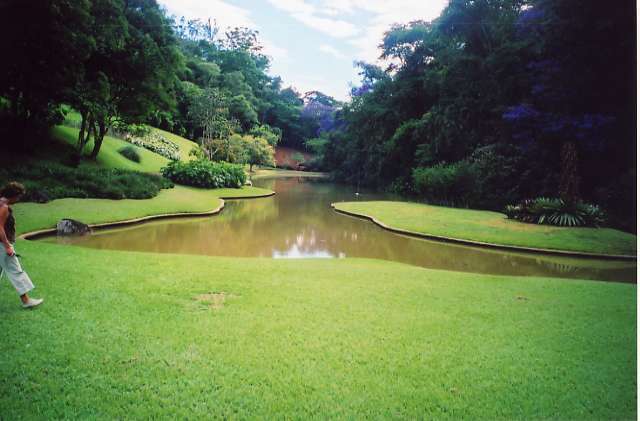 Parque Burle Marx is a wonderful garden completed in 1995 after the master's death. Access to the garden is difficult without a car and I paid dearly for trying to get there by public transit by having to walk several miles from remote bus stops. But the garden was worth the trouble as it is very well maintained and is a classic example of his work. There is a geometric arrangement to the park spaces, with a checkerboard lawn and rectangular pools and a sculptural wall backing the space. I've skipped a few places I visited that were designed by the master because the scanned slides don't do them justice or they were in poor condition. 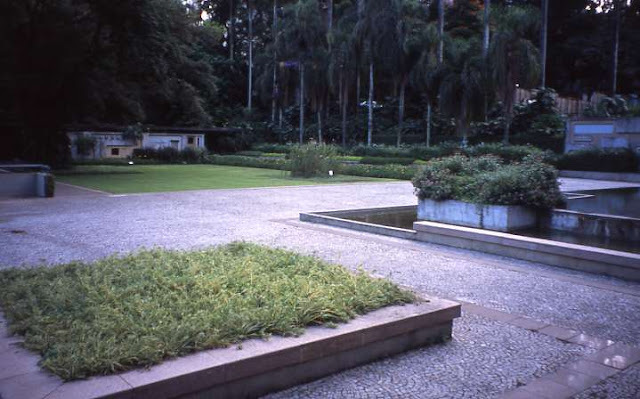 Gardens are one of those things that don't last unless there is diligent maintenance, and things grow fast in tropical Brazil. But for the most part, his legacy is being preserved as well as possible. 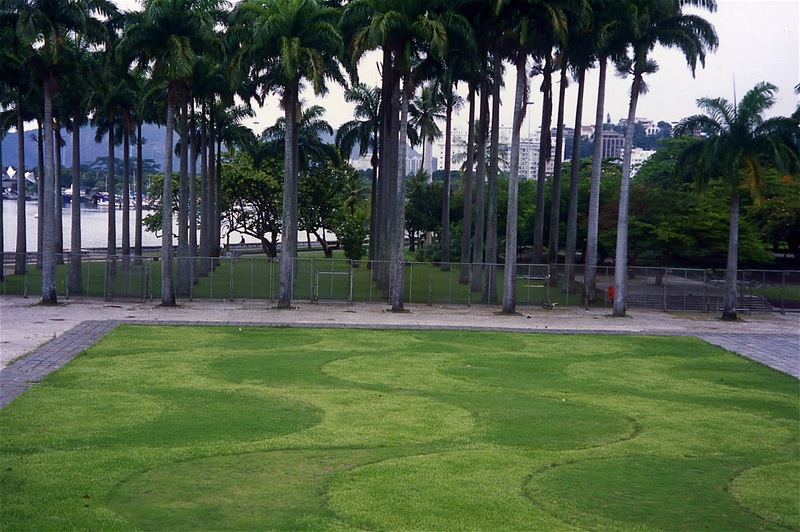 Roberto Burle Marx died of stomach cancer in June of 1994 at the age of 85. 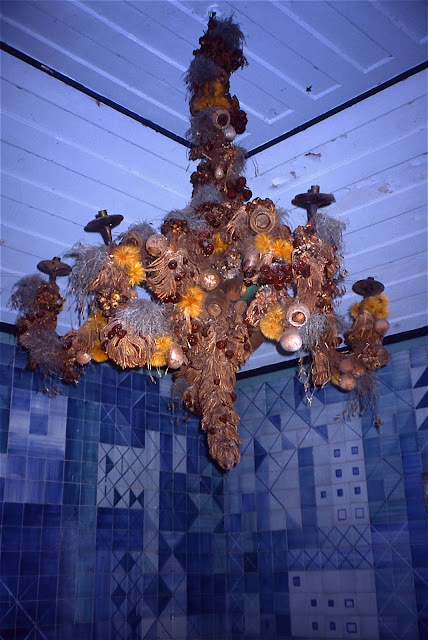 His legacy is far too great to cover in one article, but he single handedly brought the use of native Brazilian flora in to vogue, and created a style that is unique and often emulated to this day. The Landscape design world would not be what it is today without him. Wow! Wonderful post...I've got a few books that I've poured over time and time again but I hope to be able to visit in person someday...your images are the next best thing. Thanks so much for this post. 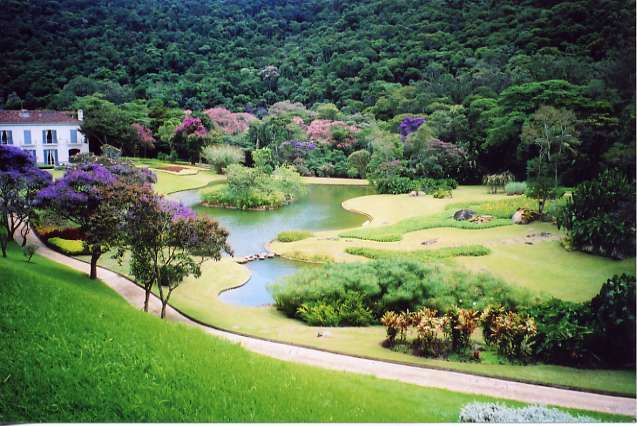 We plan to visit Rio in a few weeks' time, and it would be a treat to visit his gardens. Hi, very informative and interesting.. could you name some other landscape architects who follow the Burle Marx design principles in their work? 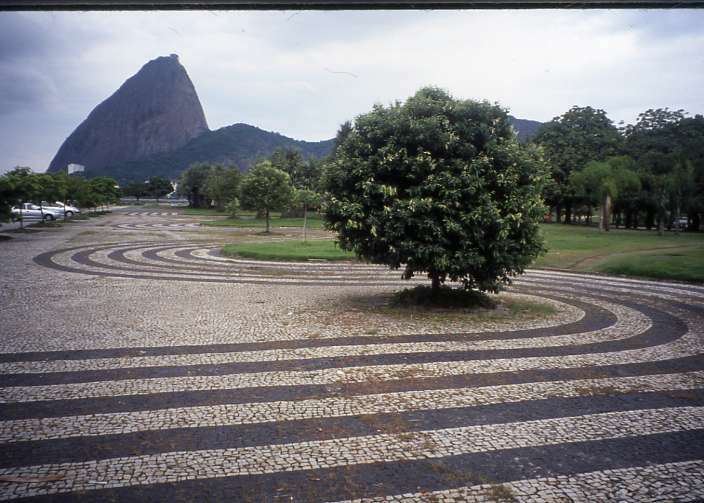 Do you recognize the influence of Burle Marx in other professionals work? Hi Andreia, I recommend you check out the work of Dutch landscape architect Adriaan Geuze, the Italian landscape architect Pietro Porcinai, the American Thomas Church, and the garden of Ganna Walska at Lotusland in Montecito, California for work that has elements that would suggest the stylistic elements of Burle Marx work. Hi, I came across your blog. I am writing a book about color in landscape architecture and one of its chapters will be devoted to Marx’s work. As I plan my trip to Brazil to see several of his work in and around Rio, I would like to ask for your advice. How can I get access to the Odette Monteiro Estate, The Strunk garden, or the Raul Martin's garden, and ? What gardens do you recommend I visit, in addition to his own residence and Monteiro? Thank you very much for any suggestion and help you can provide me.